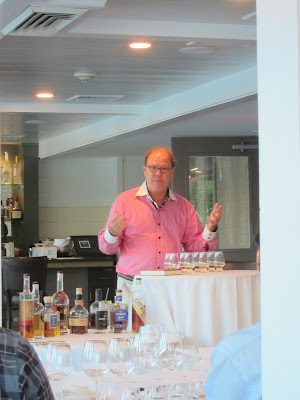 Last Tuesday, August 13th I attended a fantastic Canadian Whisky tasting event hosted by our friend Thom Mitchell of Whisky RI and moderated by Davin de Kergommeaux from canadianwhisky.org, writer of one of the best whisky books of the year; Canadian Whisky: The Portable Expert. I had tremendous fun the whole night with Stephen Matis from The Malt Impostor, Shane Helmick from How to Drink Whisky, his wife Jennifer and a great crowd of attendees. We tasted eight different whiskies throughout the night and I tried my best to take short notes for each of them. During these kind of events rushed notes neither give the accuracy nor the satisfaction I would like to achieve for a nice review but at any rate here they are... Thanks to Stephen, Shane and Jennifer for their contribution. I might have stolen their notes without even realizing. Still Waters 1+11 (40.0%): A blend of different whiskies sourced from other Canadian distilleries and their own production. Color: Pale, light amber. Nose: Sweet toffee, nutmeg and cinnamon. Palate: Caramel, cloves with strong sizzling white pepper. Quite hot. Finish: Not so long but pepper notes are even more dominant in form of crushed black pepper corns. Overall: Pretty spicy... Adding water opens up the nose a little more but doesn't help the palate. It will satisfy rye whisky buffs for sure. Still Waters Stalk and Barrel Cask #3 (46.0%): Second expression from Still Waters Distillery: a single malt. Distilled all from Canadian barley and aged in ex-bourbon barrels. Color: Pale straw, like pinot grigio. Nose: Noses like Calvados! Red apples and black tea. Palate: Very young - Amplified wood notes which I usually identify with those ultra-small barrels. A little paprika and black pepper. How odd that the nose doesn't have anything in common with the palate. Finish: It fades out with a noticeable alcohol burn and black pepper. Overall: Pretty good spirit in core but a little rushed. I will be looking forward to taste their coming releases. Century Reserve 21 (40.0%): 100% corn whisky with an elegant bottle looking like straight from a eighties movie. Color: Bright polished copper. Nose: It even noses like eighties: Brown rock candies..! Nice warming oak aromas which reminded me aged Scottish single grain whiskies I tasted before. Very sweet and mouth watering. Palate: Sweet... Aunt Jemima syrup, vanilla and burnt sugar. Thick and nice mouthfeel. Finish: Long with sweet caramelized sugar burn. Overall: A little bit one dimensional but tasty, sweet and packed with flavors.